Let’s face it — no one likes shaving. It’s all too common to feel like there’s not enough time in the day. To add shaving onto your list of things to do is just another time zapper. 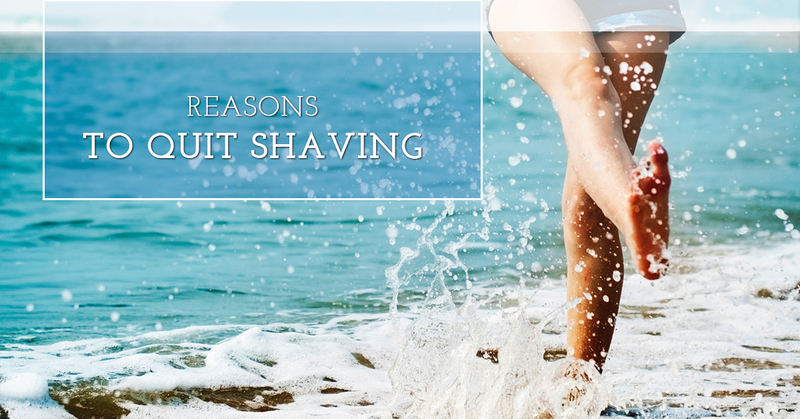 But there are actually a number of reasons, other than being time-consuming, that quitting shaving and opting for laser hair removal instead is beneficial. Pierce Medical Clinic is here to tell all. Find out why it’s time to ditch that razor for good, and choose our medical weight loss clinic for Botox®, laser hair removal, fasting programs, weight loss programs, and so much more! Because of how most razors are built, they’re not recyclable. Every time another razor bites the dust, it will add to landfills and the waste that’s consuming our planet as a whole. Making the switch to laser hair removal is incredibly more environmentally friendly. Performed in the privacy and comfort of Pierce Medical Clinic in Kansas City, a series of six to eight treatments will have you ready for summer and showing off some skin — in a way that reduces waste and helps the environment! Isn’t it frustrating when you shave your legs during your morning shower, only to realize by the end of the day that they’re already stubbly? It feels like you put all that time in for nothing! Shaving is an ineffective way to remove hair, at least when trying to remove hair in a longer lasting way. By comparison, laser hair removal lasts for an unbelievably longer time than shaving. After six to eight treatments, most patients don’t see hair growth in the treated areas for at least six months. Laser hair removal can last for upwards of a year, and sometimes even longer. That’s way more preferable than shaving which lasts for a few hours or a day at the most. Nearly everyone has dealt with razor burn or shaving cuts in their lifetime. They’re not exactly fun. And what’s more, they can cause bleeding, skin irritation, and take a long time to heal — even longer if you find yourself needing to shave a day-and-a-half later. Laser hair removal can feel a little uncomfortable during the process, but the process is relatively quick. Afterwards, you’ll need to avoid certain things that can further irritate skin, such as chlorine and direct sunlight, for about a week. But ultimately, laser hair removal is slight discomfort and minor inconveniences (if you’re a swimmer, that is) for months and months of rewarding results. Shaving adds time to your shower routine, every couple of days, basically for the rest of your life. Those are minutes that add up, and can easily be eliminated when opting for laser hair removal instead. Plus, anyone who has fun trips planned over the summer knows the hassle of having to pack up razors and shaving gels or creams. It takes up space, it has to be airline friendly, and it could all be avoided by switching to laser hair removal. Not to mention, those hard-to-reach spots for shaving are some of the biggest hassles of all. After spending all that time trying to carefully eliminate unwanted hair, you end up noticing a missed streak that you swore you got. What can we say? Shaving is not fun, and it’s an outdated process that should be replaced. If you don’t care about shaving or removing hair in general, that’s completely fine! Everyone should do what makes them feel comfortable, and even though society likes to tell us what’s acceptable hair to have and what’s not, know that you are always the ultimate judge, and that you’re in control. 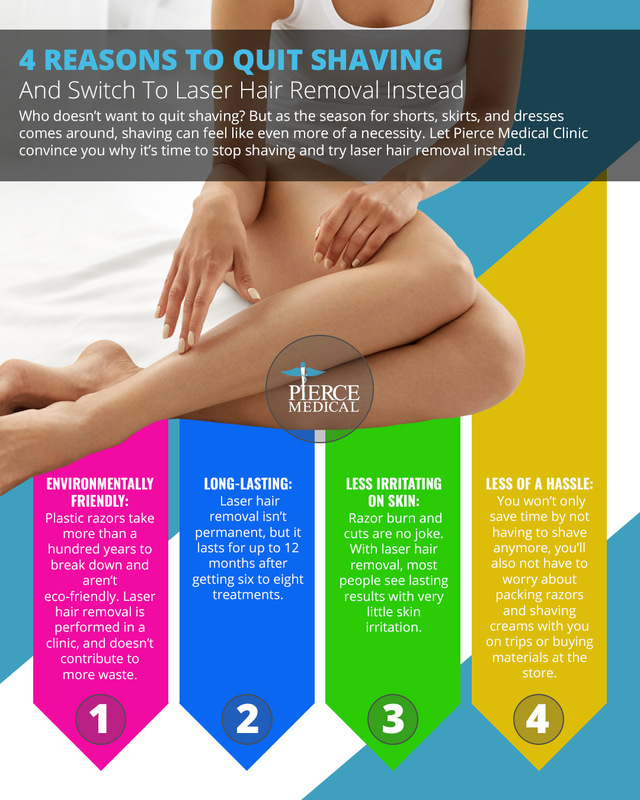 But if you’re wanting a long-lasting solution that beats shaving 10 to one, you will want to try laser hair removal, and you’ll want to try it with Pierce Medical Clinic. We’ve served the Overland Park and Kansas City areas for years, and we have the experience and aesthetic services you’re looking for to truly feel great about your body. Contact us to set up an appointment or a consultation today, and enjoy the warmer months ahead!